My sister-in-law made this cake for my daughter’s third birthday. My daughter is a huge Dora fan and this was her third year using the Dora theme. The first two years we just had store bought cakes but, this year she wanted to make a special Dora the Explorer birthday cake for Samantha. She used a sheet cake for the bottom and a cake made in a Pyrex bowl for the mountain. All of the icing is homemade butter cream colored with food coloring. She also made all the flowers. 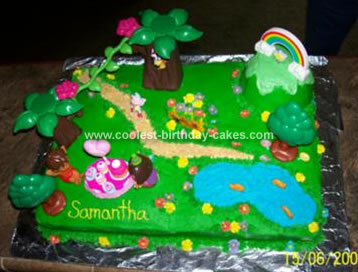 The area with the block with the band characters and flowers has a marshmallow under the flowers to put the candles in. The path is made out of graham cracker crumbs. The trees, Boots, Swiper, Rainbow, and the band block all come from a Duplo block set. Dora is from my daughter’s first cake and Diego is a bath toy! The party favors come from the Ponyville set. Samantha just lit up when she saw the cake. We are now planning her party for this year and she still wants a little Dora cake even though this year she is having a My Little Pony party!